Police officers are stationed at every school in Warwick, Cranston and Johnston through Friday after police say they received an anonymous letter threatening physical harm to children at elementary schools in the three communities. 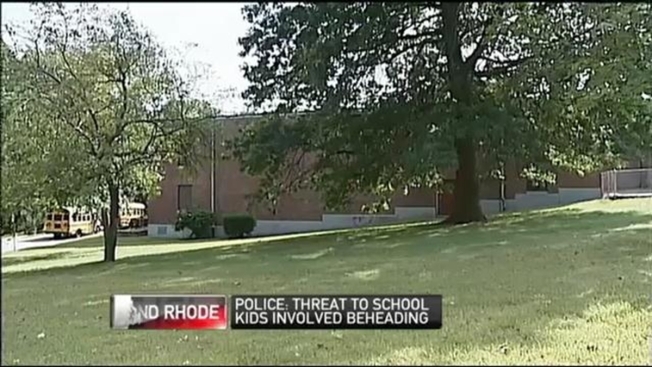 Warwick Police Chief Steven McCartney told WPRO-AM on Wednesday the threat specified that "beheading is planned." He called the nature of the threat chilling. Lt. Matthew Moynihan, a state police officer working for Cranston police, said authorities have not determined any validity to the threat. Johnston police received the anonymous threat by mail on Tuesday. Daniel Parrillo, deputy police chief in Johnston, confirmed the nature of the threat. He said the FBI and state police were assisting in the investigation into who sent it. He said it is not clear where it came from and would not comment on whether the letter had a postmark or other identifying marks. Several parents said they would keep their children at home, but McCartney encouraged them not to do that. "The schools may be the safest place to be," he told WPRO-AM. Cranston Superintendent Judith Lundsten said recess would be canceled and students will not wait outside but will enter immediately. Johnston School Superintendent Bernard DiLullo sent an automated call assuring parents that school officials are taking extra precautions with police at each school. Cranston Police Col. Michael Winquist said his message to parents is that police will handle the threat and are making sure police are visible. Also Wednesday, state Rep. Deborah Fellela, who represents Johnston, said she plans to introduce a bill that would make it a felony to threaten students in Rhode Island with physical harm. The legislation provides for a sentence of up to 20 years in prison and $100,000 in fines. A judge also could order that restitution be paid to any municipality that responds to a threat.